Clockwise frae tap: Ljubljana Castle in the backgrund an Franciscan Kirk o the Annunciation in the foregrund; Veesitation o Mary Kirk on Rožnik Hill; Kazina Palace at Congress Squerr; view frae Ljubljana Castle taewart the north; Ljubljana Ceety Haw; Ljubljanica wi the Treeple Brig in distance. Ljubljana (Slovene: [lʲubˈlʲana] ( listen); German: Laibach, Italian: Lubiana, Laitin: Labacum) is the caipital o Slovenie an its lairgest ceety. It is the centre o the Ceety Municipality o Ljubljana. 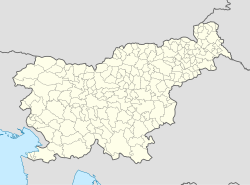 It is locatit in the centre o the kintra in the Ljubljana Basin, an is a mid-sized ceety o some 270,000 inhabitants. Throughoot its history, it haes been influenced bi its geographic position at the crossroads o Germanic, Latin an Slavic culturs. For centuries, Ljubljana wis the caipital o the historical region o Carniola, an in the 20t century it became the cultural, scientific, economic, poleetical an administrative centre o Slovenie, independent since 1991. Its transport connections, concentration o industry, scientific an research institutions an cultural tradition are contributin factors tae its leadin position. ↑ "Data on the selected settlement: Ljubljana (municipality Ljubljana)". Statistical Office of the Republic of Slovenia. Retrieved 23 January 2012. ↑ "Pobratena mesta in članstvo v zvezah". Retrieved 2009-11-19. ↑ "Zagreb sister cities". Retrieved 2007-11-29. Wikimedia Commons haes media relatit tae Ljubljana.